Scott Turner leans over and tells Hooch in the movie, “This is not your room.” Well, here in the 941 we have a young guy named Grayson who tells his Hooch, “We don’t just have room for you. There’s room for everyone.” Part of Grayson’s support system as he faces Duchenne muscular dystrophy (DMD) is Hooch. So, the 941 will have the upcoming race known lovingly as Doggies for Duchenne. 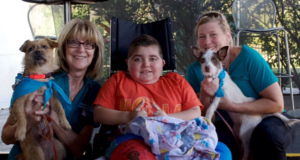 Unite together as the 941 community helps Grayson’s and others’ like him stride forward to a new day and equally benefits the Humane Society at Lakewood Ranch. Grayson’s mom Jennifer Tullio, realtor and friend Rebekah Boudrie are passionate about this cause. Avid runners in the community, they have accomplished runs of greater than 22 miles all for numerous community causes. They speak locally at numerous organizations and events about how everyone can be involved to impact human and canine lives. These passionate ladies never stop in the fight against DMD and in preserving the rescue efforts of the Humane Society at Lakewood Ranch! The Humane Society at Lakewood Ranch (HSLWR) is a no-kill, not for profit rescue and shelter organization whose goal is to save and re-home at risk animals. The emphasis is placed on saving those targeted for euthanasia due to over population. HSLWR offers a safe environment for animals including medical care, vaccinations, micro-chipping an spaying/neutering. It is supported entirely by the community it serves. Many organizations are joining the effort, including Jdubs Brewing Company. Head staff member Jeremy is spearheading the donation of six kegs of a new light wheat ale made with grapefruit puree from Tropicana. Come out to the pre-party and to the race and be sure not to miss this refreshing new flavor. Giving back to the community is one of Jdub Brewings’ foremost focuses. We want to thank them for getting involved as well. Equally important is the Humane Society in this 5K event. The organization features a staff that loves all of their family, both four and two-legged. In fact, Grayson regularly visits the Humane Society at Lakewood Ranch and follows up on how each one is doing. In a recent chat, Rebekah Boudrie expresses it best: “One of the reasons this race seems like a good marriage is Grayson’s focus on animal rescue. Grayson seems to always want to see the dogs at the humane society.” Lola, a rescue from the society, is the official Doggies for Duchenne mascot and a previous race winner. Prior to the race, Lola almost lost a leg due to injury but the staff nursed her to health and she won! So, you hear all of this and want to know how you can get involved? The Doggies for Duchenne 5K race happens in February on the 17th. Runners without canines start first, followed by runners with canines and strollers, and walkers. Age group awards are given for both humans with canines and humans without canines. Sign up includes a shirt. You don’t have to participate in the 5K to help the organizations out financially. Donations can be made directly which benefit both causes listed below equally. January 20 marks the kick off of Doggies for Duchenne! Yes, there truly is room for everyone. Join the group at Oak and Stone on University Parkway from 2PM-6PM. The Doggies for Duchenne 5K will be held on February 17, 2018 at 5261 Paylor Lane, Sarasota. The race includes options for an individual 5K, an individual one mile walk, and a human/ canine team 5K. One hundred percent of the proceeds will benefit equally the Humane Society at Lakewood Ranch and also “Another Day for Gray” (AnotherDayforGray. com). Thank you to Monika Oberer and Rebekah Boudrie for hosting this special event! Signup at: https://runsignup.com/Race/FL/Sarasota/Doggies4Duchenne.